Thousands of protesters have marched through central Paris to demand better housing for African immigrants, after two deadly fires last month. 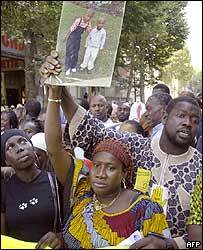 About 5,000 people marched from the site of the first fire in Paris' 13th district, in which 14 children and three adults died on 26 August. Seven people died in a similar blaze just four days later. The French authorities have been criticised for housing poor immigrants in dilapidated accommodation. The marchers, some carrying banners, called for greater investment in housing. They also condemned French Interior Minister Nicolas Sarkozy for ordering the eviction of squatters from the capital's most run-down apartment buildings. Hugh Schofield in Paris says the Parisian authorities have identified more than 1,000 run-down buildings, in which some 13,000 families - the majority of whom are African - are housed or are squatting. Saturday's protest was backed by left-wing pressure groups and political parties, French news agency AFP reported. On Friday, police evicted dozens of African illegal immigrants from two buildings declared unsafe, in line with Mr Sarkozy's orders. There have been calls for better housing since April, when 24 people died in a fire at a Paris hotel housing immigrants. Meanwhile, the city prosecutor opened an investigation into the 26 August blaze on Friday, AFP reported. It quoted officials from the prosecutor's office as saying the "wilful destruction by the use of fire leading to death" was being investigated, suggesting suspicion the fire was started deliberately.